Note: This is the first in an occasional series which will look at the literary figures who influenced the creators of sword and sorcery. The focus will be upon the writers who influenced the "first wave" of S&S authors (such as Robert E. Howard, Clark Ashton Smith and CL Moore). Harold Lamb died on this date in 1962. He left behind a staggering amount of quality fiction and nonfiction. He was one of the very top contributors to one of the premiere pulps, Adventure, and went on to become a popular and award-winning historian. What we're concerned with today is his impact on sword and sorcery fiction. There are a lot of things we don't know in that regard. We don't know whether CL Moore or Henry Kuttner were fans. Clark Ashton Smith appears to have never read Lamb, though Smith actually wrote a novel as a teen that wouldn't be that out of place in Lamb's oeuvre. We know nothing about Fritz Leiber's feelings when it came to Lamb. Michael saw that Rudolfo had taken a stand between the fire and the tower of skulls, his sword gleaming, his thin lips writhing. A rider spurred upon the condottiere — Michael noticed that the Tatar horses seemed trained to go anywhere, even near flames — and a squat black body swung from the saddle. The Tatar leader leaped at Rudolfo’s head, taking the thrust of the Venetian’s sword on his shield. Nothing like fighting Tatars by firelight beside a tower of skulls! Robert E. Howard didn't just take some pointers from Lamb in regard to pacing and word-choice. He also seems to have been inspired by several of Lamb's plots. 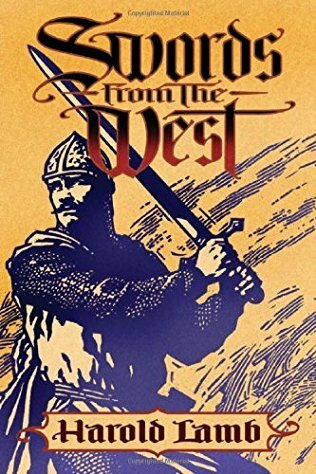 In my reviews of Swords From the West and Swords From the Desert, I examine several Lamb stories that seem to have influenced REH to one extent or another. Those are just two collections. There are tales in other collections of Lamb's fiction that warrant a look in regard to influence on Howard's plots. That will have to wait for another day. Taking into account the fact that LSdC created what I consider to be the third stream/branch/thread of sword and sorcery fiction--"de Campian S&S," as it were--then Lamb can be said to have influenced two of the three founders of the separate schools of sword and sorcery. Since the Howard Boom of the 1970's, we see even more S&S authors who claim Lamb as an influence. Some of them originally came to Lamb's writings by way of his nonfiction historical works like Genghis Khan and Hannibal, since almost all of Harold Lamb's fiction went out of print in the '60s while his historical nonfiction kept being reprinted. Among those Harold Lamb fans would be Keith Taylor, David Drake, Scott Oden, Bill Ward and Howard Andrew Jones. It is strange that the character who comes out before the curtain of this final act of the crusades should have been a clown. A gorgeous and sinister Pagliacci, who sang his own prologo and shook with inextinguishable laughter even when he crept across the stage with dagger drawn. No doubt he appears mad, but he is not. He plays the tricks of a clown to amuse himself, but he is not a clown. He is delighted because he has driven the horsemen of the horde like wild mares across the stage at his entrance, yet it pleases him better to disappear altogether from our sight. He is quite capable of coming on again as a beggar or a wandering crossbowman, or a solitary feaster at a banquet - and woe to the fellow player who gives his identity away. He is, in brief, a true actor of the East that we have never understood, and he is a great actor. One of his audience, the friar William of Tripoli, said that, as a soldier, he was not inferior to Julius Caesar, nor did he yield in malignity to Nero. Look at him in his natural person, and you will behold a giant in stature, his hair red, his broad face sun darkened; one eye blue, the other whitened by the scar that blinded it; all of his six feet clad in the colored silks, the velvet vest and wide girdle cloth, the gold-inlaid armor pieces, the black-and-gold khalat, the turban-wound helmet of a mamluk who was also sultan. His left hand is his sword hand. Well, that about wraps it up for this first installment of "Forefathers of Sword and Sorcery." Get out there and read some Harold Lamb. You won't regret it.